Thanks for your comment. Either way, changing sleeve length in a tailored jacket is a lot of work. Doesn't she have to adjust the sleeve head, shoulder pads, lining, etc.? I can't picture that being easier, but I'm always open to new thoughts. Let me know when you watch her method. We can brainstorm together! i am 5' 7" , a 32 arm length and have a 50" chest. i can't find many coats my size. any suggestions on how (or where) i can get an xxl size with a medium sleeve length? thanks. @Anonymous... I would suggest getting the coat to fit you in the chest. It would be easier to take up the sleeves than to adjust the chest area. 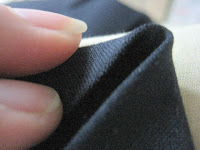 If the sleeves are super long, you may run into a problem with the break in the elbow area being too far down your arm. Otherwise, you'd be fine. Thanks Maripat for taking the time to post these how-tos. It is much appreciated. @Anonymous: Usually I don't have to close the vent when shortening 1". However, it depends on the garment and that's a great question. 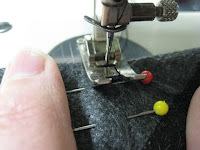 You are right, if there is not enough vent to redo, you have to stitch the vent closed, just the way you have said. Good call! I found your website and your blog some time ago and I enjoy them. So useful and encouraging for the inexperienced menders like myself! 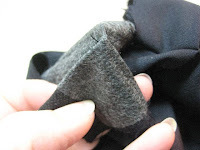 I wonder whether you could share some thoughts, whether is it possible to lengthen a previously shortened sleeve of a tweed jacket if the top fabric wasn’t cut off? I can sense other 3-4 cm of tweed inside, but nothing specific about the lining. The jacket does not seem to have been worn much after the shortening has been made. 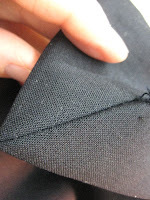 The hem is not heavily pressed and does not look napless, but the part near the vent is. The reason why I am asking this question is that I bought a jacket on the net as ‘new’ to discover to my surprise that it had its sleeves shortened for some previous owner. I would normally ask for a refund, as it is unfair to sell the used items as new. However, the tweed is exceptional, so if it is amendable I’d give it a chance. 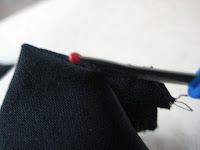 I imagine the shorter hemline can be visible if I amend it back, but are there other dangers apart from this? Thanks for your comments. Tweed is sometimes a forgiving fabric. It is easy to hide the crease marks. 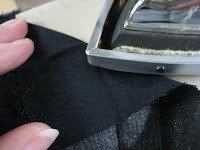 If you take apart the sleeve and you see dirt at the fold line, take it to a dry cleaner and see if they can get it out. All you can do is give it a try. If you take it apart and it looks awful, what have you lost, but a few moments of time? 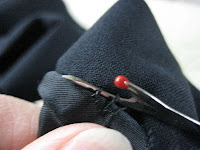 If you can't wear it as is, or you can't lengthen the sleeves, maybe you can shorten it to be a 3/4 length sleeve. 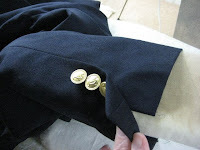 If it has a flashy lining, you could fold the sleeves up to the 3/4 length and show off the lining. Sometimes we have to be creative and design a feature that hides a flaw. Have fun with it and let us know how it goes. 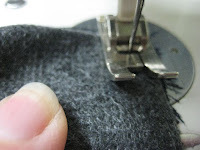 I bought two siuts in the sales this week with the intention of having the sleeves lenghtened but was horrified when told because the sleeve dsign and cut was at a miter this was impossible. Is this true and what's the benifit in having sleeves designed this way? 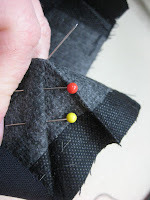 This is a great tutorial and i will soon embark on my own coat/vent alteration. 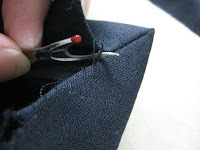 Could you give more detailed instructions on mitering the sleeves? 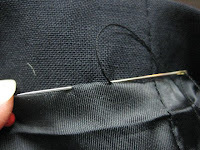 As well as this, do you rip the whole seam of the sleeve. 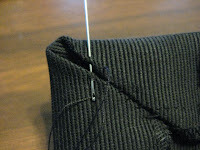 I am also planning to shape the sleeve - should I do this first before altering the length of the sleeve?